I was originally diagnosed with CKD somewhere about the turn of the century. I worked my way up the kidney disease ladder to each stage of the disease and finally I went on dialysis in 2008; Exactly five years ago today 8/21/2008. What’s particularly fascinating is that, as I went through each stage, I was totally unaware of what was going on in my case. I had Chronic Kidney Failure and I didn’t know what that meant for almost 10 years! I went to family physicians, cardiologists, dietitians, and nephrologists; clueless about what it meant to be in the process of kidney failure! Seriously, I don’t recall associating the fact that I was getting an A/V Fistula and what it was for. I just did what the nephrologist told me to do. I was an good patient in the Traditional Medical Model. Here, in a nutshell, is the problem! This is a slide from the ESRD Network that’s used in Patient-Centered Care training. 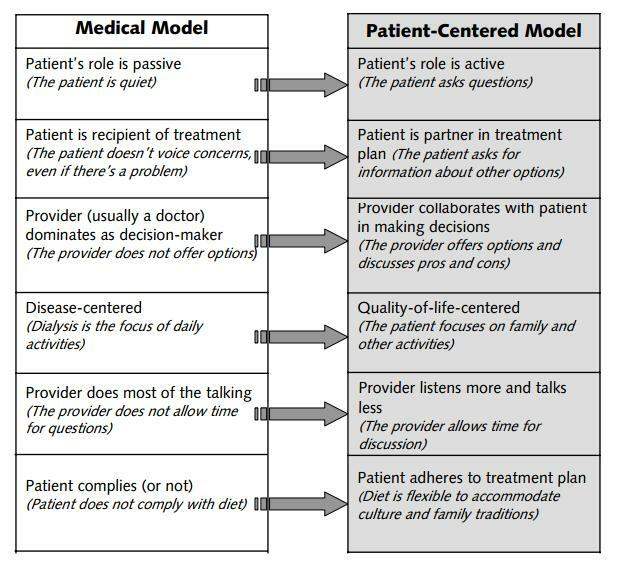 It contrasts salient aspects of the Medical vs Patient-Centered Care Models. In each element, the Traditional Medical Model comes up lacking. The patient is passive or the patient is active. 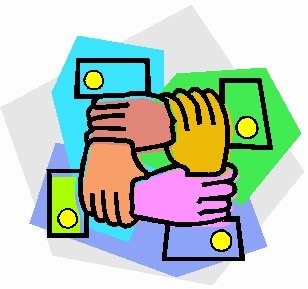 The patient is a recipient of treatment or the patient is a partner in the treatment. The provider dominates or the provider collaborates with the patient. One is disease-centered, the other is Quality-of-Life Centered. The provider does most of the talking or the provider listens more and talks less. Finally, the patient complies with the treatment plan or the patient adheres to the treatment plan. Fundamentally, the Medical Model doesn’t engage the patient and it doesn’t encourage communication. In the Traditional Medical Model, I was not a participant or a conferee. I was the recipient of medical services. The result is I knew nothing about my illness. For over ten years, I was never sure if I had Chronic Kidney Disease, Chronic Renal Failure, Kidney Failure, whatever. I wasn’t even sure what the acronyms meant. I knew what each word meant but NOT what that meant for me. I discovered I couldn’t explain to others what was happening to me because I didn’t understand it. I didn’t realize I would have a full range of symptoms. I was clueless that my extreme lethargy, mental confusion, feelings of cold in my hands and feet, weight gain, etc., were all due to CKD. I just did what I was told; took the pills, drank the stuff, peed in the cup, gave blood to the lab, etc. All without my active participation in my disease. Patient-Centered Care brings all the patient needs into the spotlight. No matter what those needs might be, it includes them in the consideration of the patient’s sense of well-being and control. It accomplishes that by engaging the patient, by making the patient an active part of their care. In the specific case of CKD and ESRD, Dr. Bear and Steve Wilkins suggest that all the needs of the patient should be addressed including educating the patient about kidney disease and symptoms and involving the patient in that process. Upon a diagnosis of CKD, the patient should be involved in all aspects their care. Further, the entire circle of participants should also be involved. Rather than waiting until ESRD, the patient should be learning about diet, chemistry and symptoms at each stage beginning with CKD-1. Also, the Primary Care Physician should be involved all along the way as well as the nephrologist and dietitian. At each stage, the patient should be taught about what’s going on and what to expect. Now that I know what I know, I have some perspective on the subject of Patient-Centered Care. Simply put, PCC involves the patient as a partner in all aspects of their care. Currently, the ESRD Network of Texas is actively training dialysis center staff is the essentials of Patient-Centered Care through the Patient Education Learning and Action Network. They emphasize Communication and Patient Engagement and they do this by including “Subject Matter Experts”, that is, Patients, like me. Back in the real world of dialysis, I must be actively involved in my care, my meds, my fluids, my diet, my labs, and adhering to my Plan of Care. Finally, I am constantly reminding myself that Dialysis is NOT a cure but a treatment and, therefore, I need to be involved in that process at all levels. I have attempted to be involved with my care but it doesn’t always work that way. Sometimes the theoretical clashes with the practical. For example, this Epic Fail. It was my Plan of Care. Everyone had input to that plan; the doctor, the dietitian, the social worker, the head nurse, the technicians but NOT ME! And tragically I was never given a copy or a synopsis so I have no idea what I should be doing other than watching my Phosphorus and Potassium levels. We are being examined again and again but very little gets communicated other than, perhaps, medical aspects of our case. All too often the patient isn’t engaged and communication doesn’t take place. We do have our work cut out for us, don’t we? This entry was posted in dialysis, Dialysis Center, ESRD, patient care, Patient-Centered Care and tagged dialysis, ESRD, hemodialysis, patient, patient-centered care, patients. Bookmark the permalink. Do not get me started on the BS that is the Plan of Care. When I was in center for nine months, I never had a comprehensive meeting with the entire care team to discuss the entire Plan of Care. Hell, I don’t even think I SAW a Plan of Care when I was in center. When I was doing home hemo, I finally threw a hissy fit over the Plan of Care. I point blank told my team that I was NOT going to sign the yearly Plan of Care update until I met ALL of them IN PERSON. I had gone for months without seeing my SW or nutritionist because they were always “too busy” to attend my monthly clinic day, even though it was planned well ahead of time. So I finally put my foot down and said that I wasn’t going to sign until I had that meeting. The State was scheduled to come in a few days and I knew the crap would hit the fan if they didn’t have that signed document. I knew it was a dirty move on my part but I didn’t care. At least after that, they realized that even though I was stable and had no major issues, I was still somewhat worthy of their precious time. Thanks for that! We’re currently working on a “SPEAK UP” project. I will use you as an example if you don’t mind.